Gibson Performance Metal Mulisha Exhaust Tips are the perfect accessory to make your truck a little meaner. 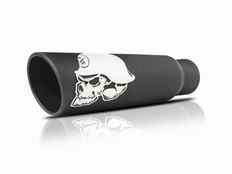 Made of Stainless Steel that is then hi-temp ceramic coated, Gibson Performance Metal Mulisha Exhaust Tips feature the famous stainless steel skull badge. The edge of the tip is rolled for an improved look.